In Memoriam: Thomas C. Marshall Jr.
Have an idea for Bob Wilhelm’s Q&A or want to share your insights? Email Bob at Questions@AuburnHeights.org. This past summer, as part of the Eastern Invitational Steam Car Tour, tour participants had the opportunity to visit the Antique Ice Tool Museum in West Chester, PA. The old barn, now converted into a museum, is full of artifacts of the 1800s, when natural ice was harvested from local creeks and ponds and stored over the summer months for consumption and for keeping food cold. 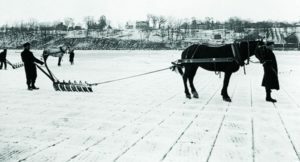 Ice harvesting of America’s ponds and lakes became one of the nation’s biggest export incomes during the late 1800s, when more than two million tons of ice were harvested annually. When ammonia refrigeration plants began making year-round ice at the very end of the 19th century, more than 20 million tons of natural-formed ice were being harvested or produced commercially. If one researches outdoor temperatures in the late 1800s, you will find weeks of below-freezing temperatures occurred during winter months in our area. This was more than sufficient “cold” to freeze the Red Clay Creek to a sufficient thickness that it could be harvested for ice. In February 1887, the Delaware General Assembly authorized the formation of the Greenbank Ice Company of Marshallton, DE, for the harvesting of ice on the Red Clay Creek. The Baltimore & Ohio Railroad is documented by the Evening Journal as harvesting 12-inch thick pond ice held behind the Greenbank Mill’s dam on January 14, 1893. 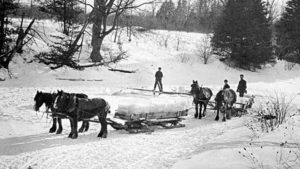 On January 8, 1900, the Evening Journal documented that 6- to 8-inch thick ice was being harvested from the large lake at Brandywine Springs Amusement Park. The Mitchell family harvested ice in winter months for storage in the ice house alongside the farmhouse and behind the creamery, which could be used for keeping milk cold. No doubt the Marshalls harvested ice for storage from the tranquil waters behind their mill dams before the age of refrigeration. Does anyone still harvest ice naturally in the U.S., and if your answer is “yes,” where is it done? Natural ice is routinely harvested in Maine, Montana, New Hampshire, and Wisconsin as well as Ontario, Canada, at least in 2019. The 190-year-old Maine ice harvest is performed by the Thompson Ice House Harvesting Museum. Around 7 tons of ice is harvested in mid-February and stored until the July ice cream social, where the ice is used to make ice cream and for snow cones. The best known and perhaps largest natural ice harvest for keeping foods cold occurs annually at Squam Lake near Holderness, New Hampshire. 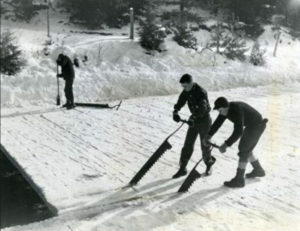 Once a commercial ice operation first operated in 1897, today the ice is harvested using more modern methods for use by the Rockywold-Deephaven Camps, a resort community open only during the summer months. Roughly 3,600 ice blocks weighing 120 to 150 pounds (roughly 16″ x 19″ by the ice’s thickness somewhere between 12″ and 15″) are harvested in mid-January to mid-March each year for storage in one of two ice houses. The ice is used during the summer months to fill the “ice boxes” located in each of the cottages on the resort property. For more information visit their website. George Kromer, the railroad fireman who created the distinctive railroad cap design, and his wife, Ida, used their success with engineer caps to expand into other garments. At the time, washing machines didn’t have the ability to “spin dry,” and as electricity wasn’t available across the U.S., many washing machines, if one could afford them, used a hit-n-miss gasoline engine for power. These early electric or gasoline-powered machines washed the clothes, but to remove the water they had to be “wrung dry.” As this didn’t remove all the water, machines had a set of powered rolling pin-type wooden cylinders that clothes could be pushed through to further remove the water. These “wringer-manglers” were constantly breaking buttons. George Kromer patented (Patent 1,695,592) an alternative to the button: Kromer’s “Garmet Fastener” had a tab that slipped through a square buttonhole-type opening to secure two flaps of clothing to be held together. As the fastener was all made of soft materials, wringer type washers didn’t ruin the Kromer Fastener as it did the buttons of the day. Kromer, in later years and still living in Wisconsin, became annoyed at his automobile sliding about during the winter months on Wisconsin’s snowy road surfaces. He invented an “Anti-Skid Attachment” for the automobile. How did it work? Kromer recognized that using either just the foot brake or a combination of foot brake and hand brake would often send a vehicle sliding along the icy road surface in any direction without the ability to steer or stop the vehicle. Kromer’s patented (Patent 2,608,274) invention attached a pivotable U-shaped steel frame to a car’s rear axle. At the end of the U-arms were mounted either steel cylinders or flat plates, both of which had spikes, studs, grooves, or similar ice-gripping means. In the case of the cylinders, a ring gear was attached to the brake drum so that it engaged a gear on the spiked steel cylinder such that the cylinder rotated in reverse of the wheel’s rotation. The hand-brake lever was reconfigured to activate the U-frame to lower it to the road surface instead of applying the parking brake. When a snow- or ice-packed slippery road was encountered, the mechanism could be activated from the parking brake handle. Coming to a stop, the driver would use the parking brake handle to lower the mechanism into contact with the icy road surface. If the spiked shoe was used, the gripping of the spikes on the shoe would bring the vehicle to a stop and hold it stopped along with light application of the foot brake. For units installed with the steel cylinder, when engaged with the hand brake, the steel cylinder would rotate in reverse of the wheel as it contacted the road surface to “dig in” to help stop the vehicle. Anyone who has ridden the Auburn Valley Railroad, or the Wilmington & Western Railroad, can generally tell the engine crew from the train crew as engine crews often wear blue-and-white pinstripe hats with pinstripe bib overalls. The engineer’s cap has become iconic with its six-panel design. What year was the first engineer’s cap made? For extra credit, who came up with the cap’s iconic design? In the late 1800s, baseball was becoming the nation’s premier sport. Baseball players wore colored caps with team logos above the brim representing the team for which they played. A steam locomotive fireman for the Chicago & North Western Railroad, George “Stormy” Kromer, played both semiprofessional as well as professional baseball. Stormy wore his baseball cap while railroading to keep the cinders from his eyes. He became annoyed at continually losing his cap to the wind generated by the fast moving train as he looked out the cab window to view the signal lights ahead. Stormy, so nicknamed due to his volatile temper when he lost a cat, had an idea for a better way to keep the cap on his head in windy conditions as well as cover his ears in colder weather. Working with his wife, Ida, in 1903, they came up with a distinctive 6-panel design made of blue-and-white pinstripe pillow ticking that Ida had on hand. Wearing it to work, Stormy’s fellow railroad locomotive peers were soon offering to pay Ida to make them an identical cap. Kromer applied for a patent in May 1909 which was granted in September 1911. The patent was later forfeited, but Kromer applied for revised patent in April 1916, which was granted on July 11, 1916 (Patent 1,190,427). The Kromers moved their operation from their Kaukauua, Wisconson, home to a bigger facility in Milwaukee, Wisconson, in 1919, where they would eventually employ nearly 30 workers making railroad caps. The Kromers sold the operation to Richard Grossman in 1965. At the start of the 21st century, Jacquart Fabric Products in Ironwood, Michigan, took over the manufacture of Kromer railroad caps. The caps were now offered in various materials with additional design features available. Over a century later, the Kromer railroad cap is still “made in America” and worn by professional railroaders as well as railroad enthusiasts and hobbyists.